In my last post, which focused on the trend towards ever higher resolutions in smartphone displays, I suggested that color performance might be a more useful area of focus for display makers. That’s because, in terms of color gamut, we are a long way from reproducing the full range of colors that our eyes can detect. 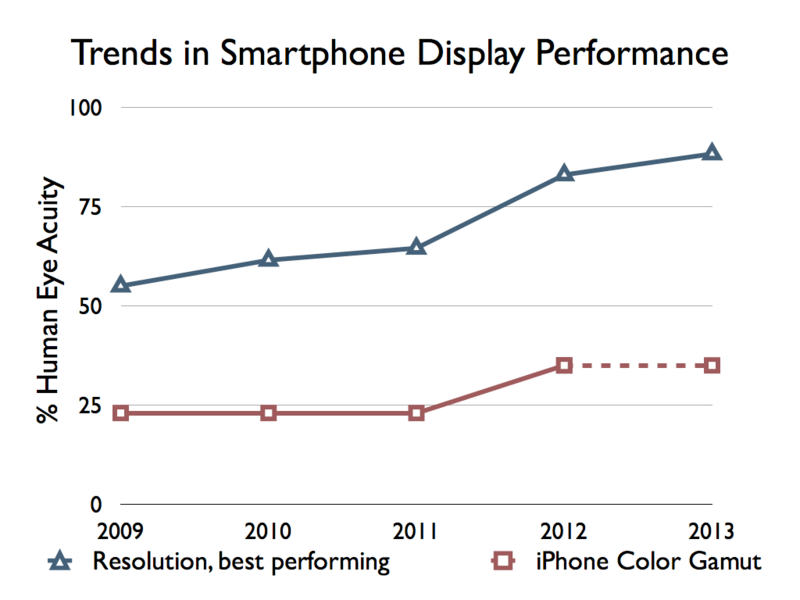 Best performing smartphones in resolution vs iPhone color gamut performance since 2009. The latest iPhone only covers about 1/3 of the range of colors our eyes can detect so we’re a long way from matching the acuity of the best displays on the market in terms of resolution. But, how much color do we really need for a great experience? As a display technologist and color blogger that’s probably the question I’m most frequently asked. If I’m advocating for more colorful displays, how much more am I after? There’s got to be a reasonable limit right? These are all valid concerns for anyone designing and marketing a new display product but they don’t really answer the bigger question. To me, what we really ought to be asking here is: what would the ultimate consumer experience be in terms of color? To answer that, I think we first need to take a step back, put some the practical stuff aside for the moment, and define what that experience should look and feel like. Once we understand that we can start to put the technological pieces together to achieve it. To find out, I’ll be taking a look at how we perceive color in my next post.